This post breaks down the basics of how take advantage of Priority Pass airport lounge access that you might actually already have as a perk from your credit card, i.e. how to find some peace and quiet while enjoying complimentary wine and food on the go. Priority Pass is a single membership that offers access to a network of about 1,000 airport lounges around the world. Most of the lounges offer access by some other means (i.e. an Air France lounge for Air France premium cabin and frequent fliers), and membership does not grant access to all the world's airport lounges (none of the big U.S. carriers American, Delta, and United airlines participate). That said, I've found that Priority Pass is the best way to unlock your access to the most airport lounges in one fell swoop because they require neither a specific ticket type , airline, nor elite status. In other words, you don't need to be flying in first or business class, you can use them regardless of which airline you are flying (even those airlines whose lounges do not themselves participate in the Priority Pass network), and you need not be a frequent flyer. In general, airline lounges are great for travelers because they offer complimentary food and drink -- I recently enjoyed a buffet of fish and chicken in Mediterranean spices, hummus, and baklava with a glass of wine in the quite nice Turkish Airlines lounge at Washington-Dulles International Airport (IAD) -- alongside spaces less chaotic and more comfortable than sitting at the gate or in a crowded restaurant. Lounges can get crowded at peak hours, but I find that whenever the lounge gets crowded, the correlative madness terminal area is even worse. That American, Delta, and United lounges are not reciprocal with Priority Pass limits its value to travelers through United States airports without a big international presence. That said, you'll usually find options at hubs, including a particularly helpful (though not terribly high end) lounge in the jetBlue terminal at Boston-Logan (BOS), the aforementioned Turkish lounge at IAD, Air France - KLM lounges at international gateways in the U.S. to which those airlines fly, and many more. Though I've not yet used a Priority Pass lounge outside of the U.S. or Europe, Meghan and I have each recently had nice experiences at Lisbon-Portela (LIS), London-Heathrow (LHR) -- which included a spa offering massage services -- and GOT. It is possible to purchase Priority Pass membership, but I find this approach rather pointless because a number of the travel credit cards I've recommended in past pieces include membership as a benefit. It's useful to think of this as a benefit with actual monetary value when signing up for a card and calculating what the actual cost of the annual fee is to you. For example, if you think you'll stop in at a lounge and consume at least $50 of food and drink four times a year, that means that the Chase Sapphire Reserve's annual fee in real dollars is $450 (the actual fee) - $300 (Chase's travel credit rebate - $200 (four times at a lounge consuming $50 worth of food and drink each time) setting you forward $50 per year in value from the card even before you use any of its other benefits. These cards convey memberships that allow you to sign your travel companions into the lounges as guests. To activate your Priority Pass membership, just call the issuer of your Chase Sapphire Reserve, Citi Prestige, or American Express Platinum card and ask them to enroll you. Expect a plastic membership card in the mail shortly thereafter. Set up an online account at www.prioritypass.com using the credentials you receive in the mail after you enroll. Download the mobile app before you head off on your first trip so that you can search for lounges using the three-letter code of the airport you are visiting (many airports have more than one, so find the one that meets your needs). Most lounges accept the electronic member card I downloaded from the app into my iPhone wallet, but I carry the plastic card in my amazing travel wallet as a backup. When you arrive to the lounge's front desk, show your Priority Pass card and boarding pass, let them know how many guests you are signing in, and proceed. 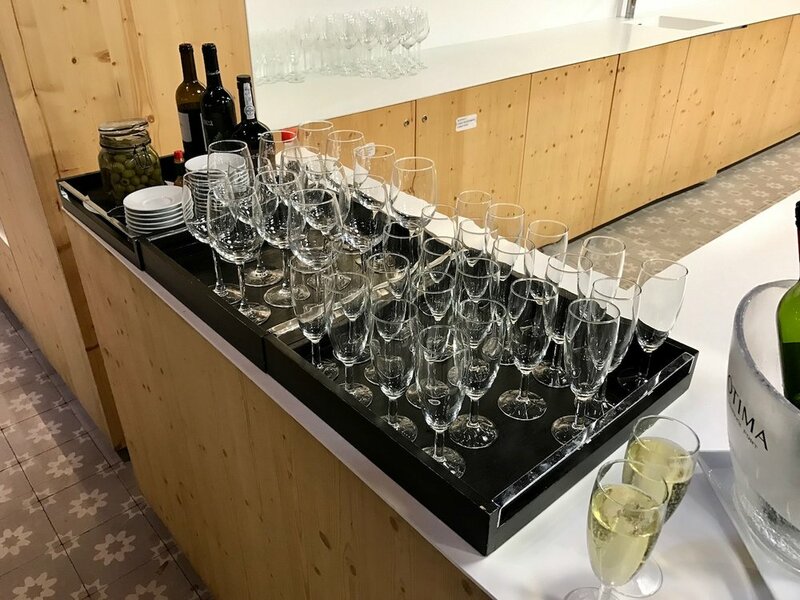 A particular lounge might be too full from time to time, resulting in you being turned away, but this has thus far only happened to me one time at London-Gatwick (LGW) airport. Find a spot to set up at a table or comfy chair once inside, be polite to your fellow travelers, and consider tipping the bartenders for their hard work (most non-alcoholic beverages are available self-service in small refrigerators). What doesn't Priority Pass get me? Simply put, the membership doesn't allow you to access lounges that aren't part of the Priority Pass network. That means that American, Delta, United, British Airways, Iberia, Virgin Atlantic, Lufthansa, and a number of other airlines' lounges are off the table… but a number of other airlines do participate and are, along with the privately operated (i.e. non-airline) lounges, fair game. This nuance might be particularly confusing to newcomers with the American Express Platinum card because the card itself provides access to Centurion Lounges and Delta lounges, which are separate from Priority Pass. In others words, show your AMEX if visiting Centurion or Delta, and show your Priority Pass member card if visiting a Priority Pass affiliate. I'm eager to hear how your Priority Pass experience is going, and which lounges around the world you have found to be nice experiences. Enjoy, and cheers!